← The first match racers? SY Hermione in New York waters, 27 July 1895, 24 days after a passage stopover at St. John’s, Newfoundland. The Red Ensign, New York YC burgee at the foremast and swan houseflag at the mainmast confirm the photo was taken while on charter from her Scottish owners to railroad and property millionaire, Robert Goelet. When the elegant G.L. 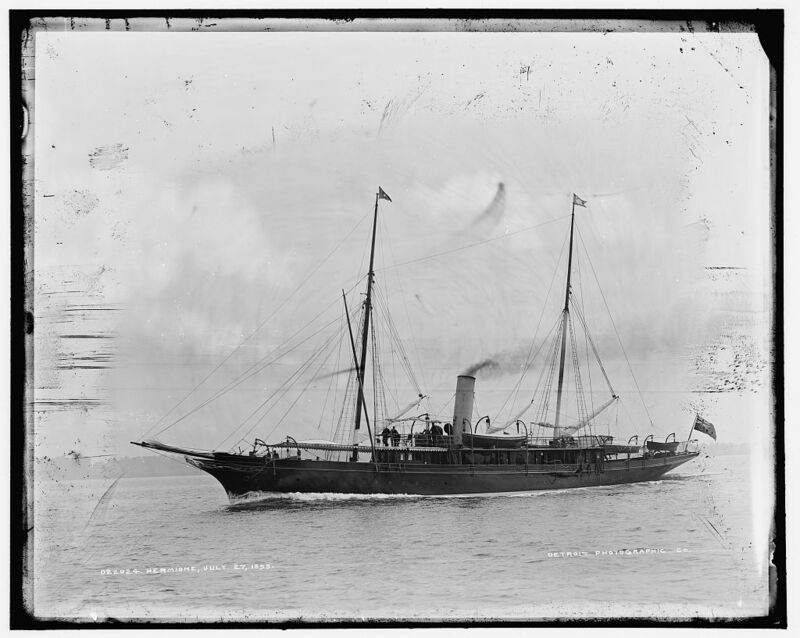 Watson-designed steam yacht Hermione arrived at the Newfoundland port of St. John’s on 2 July 1895 on passage from Gourock, Firth of Clyde, to New York, she naturally turned heads. From Gourock to New York Calls Here According to Arrangement. Pressure of 200 Pounds to the Square Inch. A speed of about 15 knots the hour is obtained. The steamer is called after a character in Shakespeare’s play of “The Winter’s Tale” – “Hermione, Queen of Leontes, King of Sicilia.” The saloon goes the full breadth of the steamer, and extends the other way sufficient to give a square and very spacious saloon indeed. All the figures of the play: Mamillius, Camillo, Sicilian gentlemen, etc. are represented. sufficient to supply 24 hours without use of the engine. There is an electric launch, 27 feet long, and, should anything get wrong with this electrical apparatus on board the steamer, the machinery of the launch would generate sufficient electricity of the demand. In a word, regarding the saloon, it is pretty well fitted in accord with the palace, characters and lives of “The Winter’s Tale.” The yacht has been chartered for 12 months to Mr. Goelet, a wealthy gentleman with business concerns in New York, Philadelphia, etc. He will use her for pleasure purposes, no doubt, doing much sailing down South. Hermione would never return to Scotland. Property and railroad magnate Robert Goelet’s charter resulted in the commission of a much larger steam yacht of his own, designed by Watson. In fact, in the autumn of 1895, Watson had excused himself from the contentious final stage of Lord Dunraven’s Valkyrie III America’s Cup challenge to negotiate orders for four large steam yachts from American clients, including Robert Goelet’s Nahma, and his brother, Ogden’s Mayflower, both eventually built by J. & G. Thomson’s Clydebank Shipyard, later to become famous as the John Brown yard of Cunarders fame. After a few years in private US ownership, Hermione experienced a long naval career as the gunboat, later patrol yacht, USS Hawk, seeing action at Cuba in 1898 during the Spanish-American War. We might think it very modern for a yacht of 1891 to be fitted with such an advanced electrical system, but this coincides with the beginning of practical electric cars – which would soon gain rapid acceptance – and no expense was spared on these forbears of the modern super yachts. The vehicular land speed record was held by an electric car until 1902. Hermione was launched 23 April 1891 at a nowadays unlikely site for a shipyard: on the banks of the River Cart, Paisley, by Fleming & Ferguson for the shipowning cousins James A. and Richard G. Allan of the Allan Line, partly as tender to their ground-breaking 10-Rater racing yacht Dora, built the same year by James Adam of Gourock to G.L. Watson’s design. Hermione’s steward was Archibald McNicol, previously heard of here as the 2nd Cook aboard the 1887 America’s Cup challenger Thistle: my great-grandfather. Read more about these early, quite hi-tech versions of the “super yachts”, and their colourful owners, in Martin Black’s beautifully written, produced and illustrated biography, G.L. 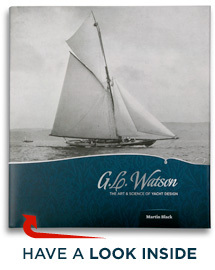 WATSON – THE ART AND SCIENCE of YACHT DESIGN, which can be purchased online at our website here, and at a growing list of other online and over the counter outlets here. This entry was posted in America's Cup, Clydebuilt, G.L. Watson, G.L. Watson & Co., G.L. Watson clients, gift, leather-bound, Martin Black, naval architect, object of desire, other yacht designers, replica, River Clyde, shipbuilding, shipyards, Steam Yacht, The Weekend Watson, yacht clubs, yacht design, yacht designer, yacht racing, yachting history and tagged Allan Line, Clyde-built, Clydebank, Earl of Dunraven, Gerry Dykstra, Hermione, hybrid, J Class, J. & G. Thompson, James A. Allan, John Brown, Lord Dunraven, Mayfower, Nahma, Newfoundland, Ogden Goelet, Rainbow, Richard G. Allan, Robert Goelet, Shakespeare, Sir Thomas Lipton, St. John's, The Winter's Tale, Valkyrie III. Bookmark the permalink.